As with all the most valuable things in life—our home, a car, our personal relationships—kayaks appreciate dutiful maintenance and liberal TLC, and will return the affection with loyalty and dependability. But perhaps the best reason to take good care of such a boat is safety. Weather and water conditions can change quickly and turn a leisurely cruise on Golden Pond into a potentially dangerous situation; the last thing you need is a broken paddle or a snapped rudder cable. I typically give my boats a fairly intensive inspection and recommissioning each year just before the summer paddling season, as well as a basic hose-down and decommissioning when I put them away for the winter. Kayaks that frequently see salt water should be hosed and rinsed with fresh water after every outing, to prevent corrosion of metal components. In addition, it’s always a good idea to inspect hardware and other fittings periodically and prior to any big trips. I offer my annual maintenance regimen below, followed by an easy seasonal checklist for your own use. Set your kayak on a pair of sawhorses for a little dry-dock time. Carefully inspect all the deck hardware, perimeter lines, and bungees. Performing T-rescues can be especially hard on deck fittings, but simple handling and cartopping can cause normal wear and tear too. The harmful UV radiation in sunlight can deteriorate plastic padeyes and degrade bungees and perimeter lines; inspect these to determine if they need replacing. 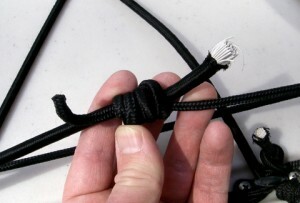 The fraying bungee shown here will receive a dab of RTV silicone adhesive or hot glue, followed by a neat sleeve of heat-shrink tubing typically used on electrical wires. If your kayak has a rudder or skeg, evaluate its deployment lines, stainless steel cables and crimps, pivot hardware, and pedals. 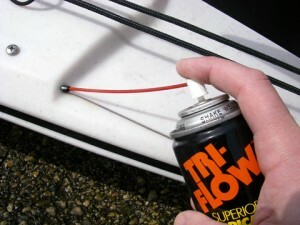 Clean and apply a spray lubricant to the rudder’s or skeg’s main pivot points and pedals or sliders; shoot a few squirts down the cable housings to lubricate the hidden interior of the guide sleeves. All kayaks and canoes made of various plastics will scratch and dent on rocks and other shore debris, but in different ways and to varying degrees. Boats made of polyethylene and Royalex, both softer and heavier plastics, are fairly prone to superficial and cosmetic scratches. Their main strength is in hard impacts, from which they tend to merely bounce off, which is why nearly all whitewater and rental boats are made of the stuff. Any deep gouges they may incur are typically bordered by a pair of raised burrs, which some fastidious owners ‘shave’ down with a razor blade for a smoother hull surface. Fiberglass, kevlar, and other composite plastics have a hard outer gelcoat which resists superficial scratches better than a poly boat, but damage is sometimes made more apparent by the glossy finish. Scratched composite boats can easily be polished smooth again; even major structural damage can be fairly easily repaired—sometimes in the field—and a good fiberglass worker can invisibly patch gouges and holes, or even completely rebuild a section of hull. 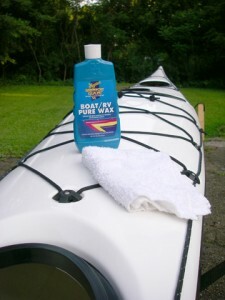 To prevent damage from harmful UV radiation, I suggest a quality automotive wax for composite boats and a UV protectant for polyethylene kayaks and canoes. I like the waxes and polishes from Meguiar’s; their marine and RV cleaners, polishes, and waxes remove oxidation from gelcoat finishes, deepening their color, and seal and protect from UV damage. Think of 303 Aerospace Protectant as sunscreen for your boat. Follow the directions on the bottle, applying it with a cloth and buffing off the excess. Unlike cheaper automotive sprays like Armor-All, etc., 303 contains no silicone (which some suspect has long-term detrimental effects on plastics), and leaves no greasy residue. 303 can also be used on composite boats instead of wax, but I prefer the additional sacrificial-layer protection and ‘slipperiness’ offered by a good paste wax. Some paddling enthusiasts advocate applying 303 for winter storage, but this serves little purpose while the boat sleeps in the darkness of the garage. The maker of 303 makes no claim to ‘condition’ or ‘restore’ plastic, but only to serve as a UV protectant and sunblock. Applying it now is like rubbing yourself down with sunblock AFTER you’ve been to the beach; the damage is already done. Save the 303 for spring, and re-apply periodically throughout the season, when it does the most good. Paddle manufacturers offer varying advice on proper maintenance of their products; some permit the judicial use of a ‘dry’, non-dirt-attracting lubricant such as graphite or silicone on their snap-together ferrules, while others specifically recommend against this, and instead suggest simply washing well after each use. Follow the care directions found in your paddle’s instruction sheet or on the manufacturer’s website. In any case, it is always a good idea to quickly swish the joint ends in the lake or river just prior to joining them, to rinse away any sand or grit. The 303 UV protectant that prevents sun damage to your hull will do the same for nearly all your other exposed paddling gear: PFD, spray skirt, neoprene wetsuit, booties and gloves, drytops and pants, even your drybags. All this same gear should receive a water-resistant lubricant applied to the zippers; there are several brands of commercial products made for this purpose, to keep the zippers zippy. Lastly, replenish any perishable items in your first-aid kit and bailout bag, such as energy bars and other food, batteries, glues, etc., and hit the water! After a long summer of idyllic cruising or intrepid adventuring, it may be tempting to toss your kayak in the corner of the garage to rest until next season. But if she has served you well this year, and you hope she will next year, now is a good time for some deserved care. Set your kayak barnacle-side-up on a pair of sawhorses and start by hosing it down as you would your car. Even mild household detergents will strip your hand-buffed wax off, so instead, lather your boat up with a bucket of boat/RV wash and sudsy water. From beneath, spray water throughout the cockpit interior and all the hatches, allowing any loosened sand, crud, and dead bugs to drain out. If possible, remove the seat bottom to clean beneath it. If you prefer to perform any repairs or modifications during winter layup, do your full inspection now instead of in the spring. If your rudder utilizes bungees to provide return tension on the pedals, loosen the pedals’ adjustment straps during winter storage to help those bungees retain their elasticity. For the same reason, undo any quick-release buckles on hatch straps and remove neoprene hatch covers (those jaunty black berets like the art students wear) from the hatch rims. To allow air to get in but keep vermin out, use large rubber bands to attach pieces of nylon window screen over your hatch rims. All kayaks, whether plastic or composite (or even sealskin over spruce, I suppose) should be stored either on well-padded rigid brackets or suspended in slings made of 2- to 3-inch-wide nylon webbing straps, like automotive seat belts. Various manufacturers offer a wide array of kayak-storage solutions, such as this fine one from Talic. Consult the owner’s manual or website of your kayak’s maker to determine whether they recommend storing your kayak right-side-up, inverted, or on its side. One thing on which they nearly all agree is that wall brackets or slings should be aligned with the bulkheads of your boat, where the hull is strongest. Any kayak will be overstrained by supports which are too far toward the middle or the ends of the boat, or (cringe!) suspended from the ceiling by ropes attached to the boat’s carrying toggles. Your paddle, bilge pump, and paddle float should all be washed with a mild detergent, dried, and inspected for damage. Sea water is especially hard on soft goods like clothing, with salt deposits jamming zippers and snaps, and even plugging up the micro-pores necessary for high-tech fabrics to maintain their breathability. Hand wash your PFD, spray skirt, neoprene wetsuit, booties, gloves, hatch covers, and drytops and pants in a washtub with a purpose-made neoprene shampoo. 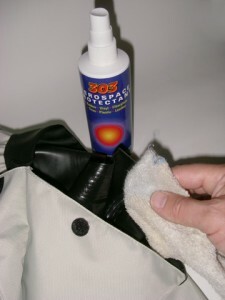 Other paddling and camping soft goods such as drybags may be washed in a mild detergent. If anything has attained a bit too much aromatic “character” over the season, use MiraZyme Odor Eliminator. This miracle enzyme does wonders for even the funkiest of footwear and other neoprene gear. 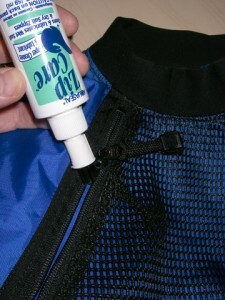 Inspect and repair any damage to your paddling clothes, and replace any weak zippers or straps. Apply 303 protectant to your drysuit’s latex gaskets, as it protects this especially delicate rubber against damage from harmful ozone. You can also apply 303 to the rest of your clothing and gear, but, as already mentioned, there is little need for sunlight protection in the shaded confines of your home or garage, so save the stuff for the paddling season. Store your clothes in a cool dry place out of direct sunlight, with all zippers OPEN. Remove any perishables from your first-aid kit and bailout bag, such as energy bars and other food, batteries, glues, etc.. While the winter snows howl outside and you pore over your charts and guidebooks, plotting and planning, you can rest easy in the knowledge that your boat and your gear will be ready and waiting for you and next year’s adventures. Here’s my current annual maintenance list, applicable to both composite and poly kayaks. As evidenced by the revision number above, I will post any future, updated list here as needed. I live in Vero Beach Fla. What type of wax should I use here?? Just bought 2 aruba 10′ kayaks. Any help will be appreciated. Michelle, congratulations on your new kayaks, and on taking good care of them! Your new Aruba kayaks are made of polyethylene plastic, so will benefit more from a UV inhibitor, rather than a wax, which is more commonly used for composite (fiberglass, Kevlar, etc.) kayaks. 303 Aerospace Protectant is like sunscreen for your boat, and is well-suited to poly kayaks like yours. I have been given a Virus Yole that has stains from sitting in lake water. What is the best way to remove the stains and get this boat looking like new ? I have pressure cleaned the boat with soap and water and am ready to proceed with any advice you can offer . Thanks so much . :-). Also, I have purchased a Lifetime Kayak and have just introduced it to the private lake where I live . It is a beautiful lime green and I want to keep it that way . What protectant is best for this kayak and would it be advisable to keep it under a tarp when not in use ? Thanks so much for any guidance you can offer ! Your Virus Yole is made of polyethylene plastic, which generally is very stain resistant. But when it does get stained, it can be equally difficult to clean. I suggest trying a succession of increasingly strong cleaners like vinegar, chlorine bleach, CLR cleaner, or oxalic acid. Whatever you use will benefit by placing an old towel over the stain and pouring the cleaner onto the towel, to help keep the cleaner on the stain for awhile before rinsing off with water. The best protection for poly kayaks is the abovementioned 303 Aerospace Protectant, which prevents UV degradation from sunlight. Anything you can do to keep the boat out of direct sunlight will definitely keep it looking good. If you use a tarp, be sure to drape it LOOSELY over the boat or suspended by guy lines, as direct contact can sometimes cause stains from condensation, etc.. Thanks for the detailed maintenance list. I am new to kayaking and this article is very informing. We are about to purchase 2 – 12′ Old Town Dirigo Kayaks. We live on a lake in Maine and the access to the lake does not make it a simple process to pull the kayak on land when not in use. I was considering leaving them in the water tied to the small / narrow dock, covering the cockpit to keep out the rain and lake water (waves). They would be exposed to the sun most of the day. Do owners typically leave kayaks in the water? Regarding winter storage, any thoughts on outdoor storage? There is no indoor storage available. You can certainly leave polyethylene kayaks in the water indefinitely, using the precautions you mention, though very few paddlers do so. Cockpit covers will keep out rain/waves and dirt/bugs/leaves. You can help matters a bit with the use of 303 Protectant, but this will wash away with rain and waves, so will require frequent re-application. The best solution, if possible, would be to haul the kayaks out of the water after each use and store them under covers or tarps. Winter storage is virtually the same, protecting them from sunlight. The cold will not affect/harm them, though it will temporarily make the plastic brittle WHILE they are cold; once they warm up again in the spring, they’ll be fine. We are storing our fiberglass touring boats outside this winter – we’ve moved and no longer have a garage to keep them in. We have purchased Danuu covers and have them up off the ground. My question is whether the boats should be stored right side up or upside down due to the potential snow cover that may sit on the boats over the winter. Elizabeth, the upper decks and lower hulls of most fiberglass kayaks are shaped rather similarly, aside from the cockpit, of course. So, it seems either way would accumulate the same amount of snow. 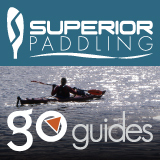 If your kayak covers tend to sag at the cockpits, snow and ice could certainly accumulate there and either leak into the kayak or tear the cover itself. So I’d suggest storing the boats upside-down, and try to clear teh snow whenever you can, or add a simple tent-like tarp to shed snow as it falls. For gel coated kayaks I would recommend Klasse. I have used this stuff on my cars for over 10 years now. Way superior to ANY wax. Its an acrylic sealer. I have used this on my gel coated kayaks and works great. There are two parts to it. You can use only the one part called the All In One but I also put on the Sealant Glaze too as I do on my car. Thanks for the suggestion, Dan. Seems the newer ‘waxes’ and other protectants are getting better all the time, so it pays to check out new stuff every now and then. Will have to give it a try next time. I have a Essence 17 kayak. The finger pull lever for the rudder doesn’t drop the rudder. How do I fix this? Unless I’m mistaken, the Essence 17 comes with a skeg, not a rudder, although an aftermarket rudder may also be installed. Either way, these generally hang up when the cables or lines and/or pulleys become stiff, and usually only require a bit of silicone spray lube on any metal moving parts. If this doesn’t help, you may need to take it to a local paddlesports shop to have their service dept. take a look at it for you. I just purchased a used Wilderness Systems Tsunami and it has some scratches on it. I know you recommend using a UV protectant on polyethylene boats but I was wondering if I couldn’t wax it as well to lessen the appearance of the scratches. Leslie, yes UV protectant will guard against sunlight damage, so is best used on the upper deck surface of both poly and composite boats, but can also be applied to the underside if you store your kayak upside-down. A good auto wax will restore some of the shine to your boat’s underside, where you probably don’t need the UV protection, and will also help it glide better over rocks and other obstacles, preventing future scratches too! In fact, many car waxes contain some UV inhibitors, so you could use it on the entire boat, though I doubt it provides the same degree of protection as something like 303. Dave, most all metal fittings on sea kayaks, and especially those from Necky, are made of stainless steel or other non-corroding metals, so no other treatment is typically needed. I’d suggest only a good rinsing or hosing with fresh water after each day’s saltwater trip. Foot braces and some other mechanisms can indeed become fouled by a crusty buildup of salt and sand, so these can benefit from a periodic hosing too. If going so far as disassembling them for a good cleaning, I would also apply some sort of water-resistant but ‘dry’ lubricant like a silicone spray or paraffin wax, which will not attract grit and salt. To lubricate your skeg cable in place, set the kayak on its end, nose up, and secure with ropes, etc.. Work the skeg control knob back and forth while running fresh water into the end of the nylon guide tube, trying to flush water all the way through the tube and out the bottom/stern end. Follow this with the same silicone lubricant, forced into the upper end of the guide tube until it comes out the skeg end. If your skeg cable is actually so corroded as to be in danger of snapping, it should be replaced with a new cable, well lubricated during installation. Many manufacturers recommend a paraffin wax, and some paddlers prefer a dry, dirt-shedding lubricant like those used for bicycle chains. Hope this helps, and paddle safe! Bicycle chain lube.. great idea and l have lots. It is primarily the foot braces that have some salt water corrosion as l believe they are aluminium and not stainless or if they are it is a very low grade. To remove and reinstall them l was going to butter up the attaching screw holes with an application of Lexel sealant to ensure watertighteness .. is that a word? Hey Dave, my wife and I purchased a used Malibu 2xl. It has some scratches on the hull. I know they probably aren’t a big deal, but how would you suggest smoothing it out? I would like to remove as many of the scratches as possible before applying some 303 as you suggest above. Any info you provide is greatly appreciated. Dave, I have found that a simple razor scraper works well for taking down the burrs which form on each side of a scratch or gouge in a polyethylene kayak hull. Just place the blade at one end of the scratch at a shallow angle of about 30 degrees to the surface of the boat. Slowly push the blade along the scratch, much like a wood plane, to shave down the raised burrs. This, of course, won’t remove the scratch itself, just the excess plastic on each side of it, but it will help smooth out the hull. If you don’t want to “lose” any plastic you can try using a hot iron on the scratches with burrs or even an area that has a bunch of scars on it. Get the iron hot and keep it moving rapidly back and forth. The scars will soften and meld into the plastic around it. It is kind of fun to do. Just remember to keep a close eye on your progress and keep that iron moving! I have smoothed out the chewed up bows and keels of used boats I have bought. They may not look exactly like new they are smooth and I have not lost any plastic. Have fun with it. Also you can fill holes using other poly plastic using a soldering iron. Fun to weld! Thanks for your tip to do maintenance on your kayak so that it is safe to use. I like how you said that your boat should be prepared for any random weather that may occur while on the water. Thanks for your tips, but my husband is considering hiring a professional to do some kayak repair for us since he lacks the skills and time. I am guessing you can apply this to kayak and other similar straps. Suzanne, if you’re referring to the 303 Protectant, yes, it’s effective on many other kinds of synthetic materials like nylon straps, vinyl-coated roof racks, spray skirts, etc.. Just be sure to follow the manufacturer’s instructions before using on other gear.